Sekai o Yoku Suru Zankoku na Method (Cruel Method to Make the World Better), a new manga written by Makoto Fukami and illustrated by Kosuke Yamanami, was released in the February issue of Ichijinsha's Comic Rex magazine on December 27. 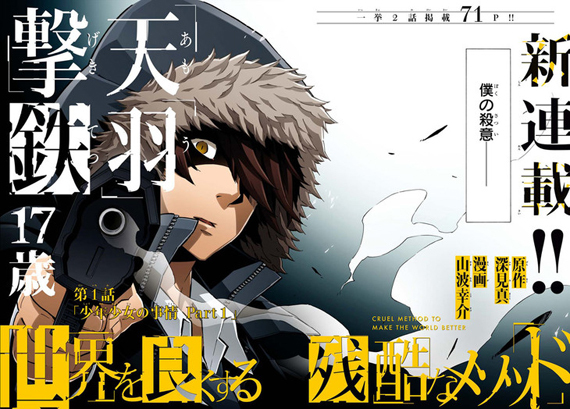 The manga launched with its first two chapters, for a total of 71 pages, and included a color opening page. The manga follows Gekitetsu Amo, a 17-year-old protagonist who does not stand out in school, but under the excuse of "eliminating harmful elements from the world" begins committing mass murder. Fukami is best known for writing the scripts to the Psycho-Pass television anime (but not the Psycho-Pass 2 television anime sequel) and the anime movie. He has also written or overseen scripts in such anime as School-Live!, Yuruyuri Nachu Yachumi!+, Yuruyuri San Hai!, Berserk, and the Resident Evil: Vendetta movie. He has written the story for such manga as Chotto Kawaii Iron Maiden (collaboration with artist Alpha AlfLayla) and Osama-tachi no Viking (collaboration with artist Sadayasu).